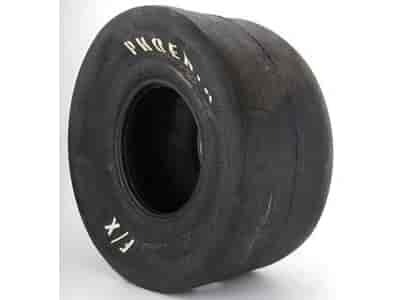 Phoenix Drag Tires F/X Drag Slick 32.0" x 14.0" - 15"
All Classes: All cars should run tubes as they add to the overall stability of the tire / wheel package and repeatability of the tire from run to run. Air Pressure: The best rule of thumb is to use as much air as possible for the track conditions without making the tire spin. Tire Rotation: Tires should be mounted in the direction of the arrows. After several passes the tires can be swapped side to side. This rotation should occur whenever a medium grain appears on the tread face of the tire. Most cars can get by with rotation every 12 to 20 passes. In some cases you will need to rotate every couple of passes. Burn-Outs: Compound improvements have helped to reduce the need for long smoky burn-outs. Drive through the water box to prevent excess water being trapped in body panels, lock anti-roll device, begin burnout, watch for smoke to rise. At that time release braking device and accelerate to the start line. Go directly to the start line, it is not recommended to do any dry hops, as this will allow better heat transfer to the track surface. Please note, that this is a general guideline and if in your experience with your vehicle you have found that another combination in the burn-out process will work better, use your approach. Tire Storage: As with any rubber article, tires should not be stored in extreme heat or direct sunlight. Keep tires away from any high voltage electric motors and do not store on a concrete surface. Tires should be stored at room temperature and placed in a dark plastic bag and sealed if being stored for a long period of time. It is not recommended that traction restore or traction bite compounds be used, as once they are applied, they must be applied each time you race. These compounds create a chemical reaction which can result in a change to the compound (SEE WARNING BELOW). Mounting: Upon mounting of tires, check circumference of the set for matching sizes. This is to be done before installing rim screws. Adjust tires within 1/4? before running. Proper sizing is required for safety reasons. DO NOT USE ANY LIQUID FLAT FIXERS, as this will cause an out-of-balance condition. USE A TUBE FOR FLATS. WARNING: NEVER attempt to chemically treat or alter the tire and/or tread compound of the tire, such as soaking or the use of tread softener. This could result in premature or catastrophic tire failure with resulting serious injury or death. Tire changing should be done by trained personnel using proper tools and procedures. Failure to follow stated mounting procedures could cause faulty positioning of the tire and cause assembly to burst with explosive force sufficient to cause serious injury or death. Clean rim, lubricate rim and beads with rubber lubricant. ALWAYS lock wheel on mounting machine or place in safety cage, and use extension gauge and hose with clip-on air chuck. STAND BACK, NEVER exceed 35 PSI to seat beads. Phoenix F/X Rear Slicks are engineered to ensure you have the highest quality of exactly matched tires available; making these tires the choice of champion drag racers. Phoenix uses a special device to measure compound hardness, roll-out and tread width (inflated to recommended pressure) on each F/X Drag Slick. Phoenix F/X rear slicks feature a lightweight design and are available in a variety of sizes and compounds. The bottom line is that nobody does a better job of producing and matching tires than Phoenix.